a leading global media technology provider for the creation, distribution, and monetization of media assets for global media organizations, enterprise users, and individual creative professionals, today announced a new live sound partnership with NMK, a leading distributor of professional audio, video and communication products in the Middle East. 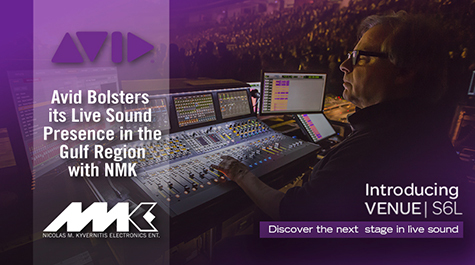 Based in Dubai, NMK Electronics will further build on Avid’s distinctive live sound presence in the Gulf region, providing support in Bahrain, Kuwait, Qatar, Saudi Arabia, Oman, UAE and Yemen. With over 25 years of industry experience, the regional market leader has cemented its status by adding Avid’s comprehensive live sound tools and workflow solutions to its portfolio. These include the most requested live mixing systems in the world, Avid VENUE™ | S3L and SC48 consoles and Avid’s flagship live sound system, Avid VENUE | S6L. “Having the experience of building brands in the Middle East, our team are really excited about the relationship we’ve started with AVID.I truly believe content creation is becoming ever so important for Clients and AVID has always been leading cutting edge content creation strategies with the Protools software. Selling the AVID consoles is different to selling other audio mixing consoles…it’s providing our customers with a complete solution rather than simply a piece of Hardware. AVID is a well-established and respected brand in the AV industry and having a solid brand is just one part of the winning formula. The other more important part is working with a team of talented individuals who really understand the product and market. We’ve already received lots of positive feedback from the market and I’m confident in our team's ability to make the AVID live mixing consoles a real success in the Gulf Region” said Constantinos Drimakis, Business Development Manager at NMK Electronics. Avid VENUE | S6L has been adopted by some of the industry’s legendary live sound engineers and taken out on the world’s most demanding tours. Its performance and reliability has enabled engineers like Greg Price (Black Sabbath, Tool), Paul “Pab” Boothroyd (Paul McCartney), and Sean “Sully” Sullivan (Red Hot Chili Peppers, Beck, Rihanna) to achieve better sounding mixes for artists around the globe. Avid VENUE | S6L is a fully modular, scalable live sound mixing system that delivers best-in-class functionality for a range of live sound mixing applications, including front-of-house, monitor, broadcast, theater, and more. Featuring modern, touchscreen workflows and the industry’s most advanced live sound engine, Avid VENUE | S6L offers unprecedented power to easily handle large, complex tours and events. Thanks to tight integration with industry-standard Pro Tools®, Avid VENUE | S6L functions as the perfect front-end to the MediaCentral Platform.